Looking at the history of our living conditions can help us assess our situation now. Researchers measure extreme poverty as living with less than 1.90$ per day. These poverty figures take into account non-monetary forms of income – for poor families today and in the past this is important, particularly because of subsistence farming. The poverty measure is also corrected for different price levels in different countries and adjusted for price changes over time (inflation) – poverty is measured in so-called international dollar that accounts for these adjustments. The first chart shows the estimates for the share of the world population living in extreme poverty. In 1820 only a tiny elite enjoyed higher standards of living, while the vast majority of people lived in conditions that we would call extreme poverty today. Since then the share of extremely poor people fell continuously. More and more world regions industrialised and thereby increased productivity which made it possible to lift more people out of poverty: In 1950 three-quarters of the world were living in extreme poverty; in 1981 it was still 44%. For last year research suggests that the share in extreme poverty has fallen below 10%. That is a huge achievement, for me as a researcher who focuses on growth and inequality maybe the biggest achievement of all in the last two centuries. 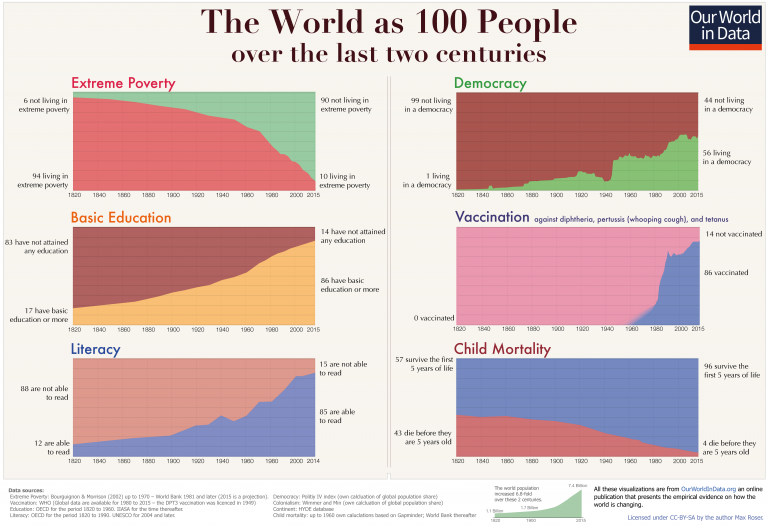 It is particularly remarkable if we consider that the world population has increased 7-fold over the last two centuries – switch to the ‘Absolute’ view in the visualisation below to see the number of people in and out of poverty. In a world without economic growth, such an increase in the population would have resulted in less and less income for everyone; A 7-fold increase in the world population would have been enough to drive everyone into extreme poverty. Yet, the exact opposite happened. In a time of unprecedented population growth our world managed to give more prosperity to more people and to continuously lift more people out of poverty. Economic growth was also important because it changed the relationship between people. 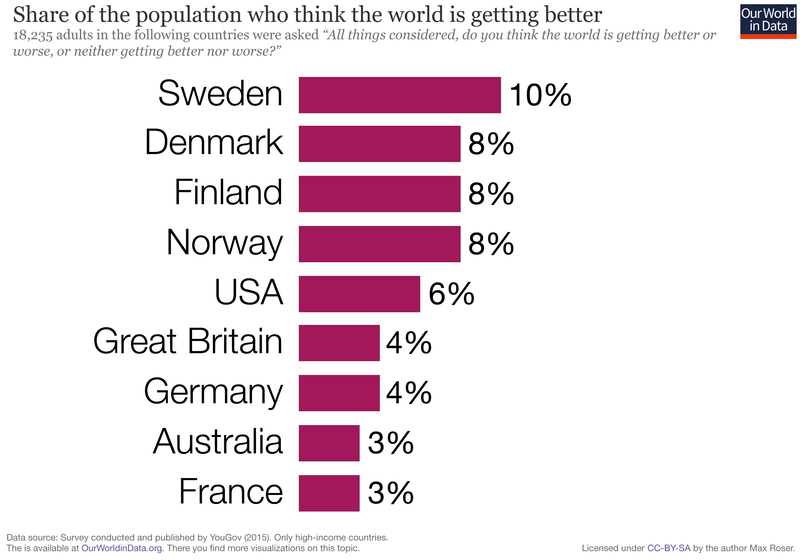 In the long time in which the world lived in a non-growth world the only way to become better off is if someone else got worse off. Your own good luck is your neighbours bad luck. Economic growth changed that, growth made it possible that you are better off when others become better off. The ingenuity of those that built the technology that increased productivity – the car, the machinery, and communication technology – made some of them very rich and at the same time it increased the productivity and the incomes of others. It is hard to overstate how different life in zero-sum and a positive-sum economy are. It would be wrong to believe that modern medicine was the only reason for improved health. Initially rising prosperity and the changing nature of social life mattered more than medicine. It were improvements in housing and sanitation that improved our chances in the age old war against infectious disease. Healthier diet – made possible through higher productivity in the agricultural sector and overseas trade – made us more resilient against disease. Surprisingly improving nutrition and health also made us smarter and taller. Human rights are similarly difficult to measure consistently over time and across time. The best empirical datashow that after a time of stagnation human right protection improved globally over the last 3 decades. VII. Why do we not know how our world is changing?